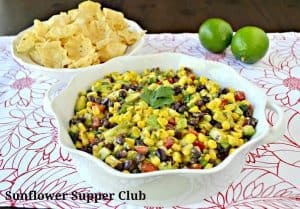 I have a corn and black bean salad recipe that my family just loves. You can find the recipe here. I have a deep love for Chipotle Chiles and thought they would be a great addition to this salad. I tried the avocado because our local grocery store had them on sale for $1, and it added a great creaminess to the salad. If you don’t like things too spicy, I would suggest you start with only 1 Chipotle Chile. We ate it like a dip with scoops, but it would also be great served as a side with grilled chicken or fish. In a large bowl mix the corn, black beans, red pepper and green onions. Gently mix in the chopped avocado. In a small bowl whisk together the vegetable oil, lime juice, red wine vinegar, Chipotle peppers, garlic, cilantro, cumin, salt and pepper. Pour over the corn salad and gently mix. Cook's Notes: To chop Avocado~Slice avocado lengthwise in half and remove the pit. Leave in the shell, take a knife and slice down the avocado, and then across in a criss-cross pattern. Take a spoon and gently scoop cubed pieces into your bowl. I linked this recipe up to the Totally Tasty Tuesdays link party over at Mandy’s Recipe Box. 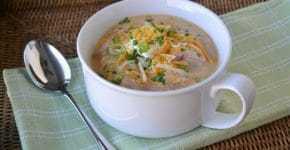 I’ve also linked up to the Church Supper over at Everyday Mom’s Meals. Linked to the Recipe Roundup over at Gooseberry Patch.